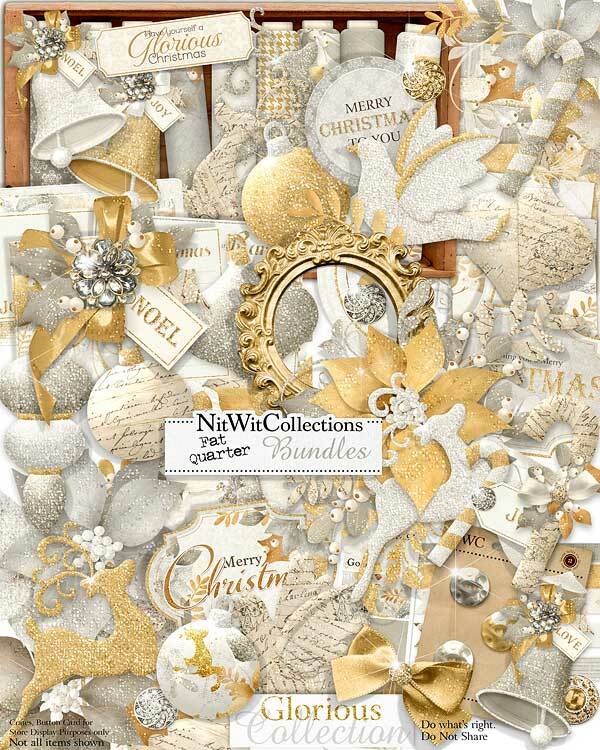 FQB "Glorious" Collection draws you in with its elegance and colour range to the cherished memories we all have of our past Christmases. 1 Cluster of Christmas leaves tied with a gold bow and a festive message of "Noel"
6 Unique floral corners with transparent backgrounds to easily place onto any paper or other element to add such class. Use it as you would a stamp.....play and enjoy! 3 Frames, from the simple to the ornate! 1 Journal card - "Always keep Christmas in your Heart"
1 Journal card - "The Miracle of Christmas"
2 Mistletoe elements....a kiss may not be just a kiss?? 7 Ornaments with a vintage feel. Which one will you "hang" on your Christmas creation?? 1 Sentiment circle - "Merry Christmas to You"
1 Sentiment label - "Wishing you a Merry Christmas filled...."
1 Sentiment label - "Merry Christmas"
1 Word strip = "Have yourself a Glorious Christmas"